The Integration Development Guide is written with the user in mind, ensuring a consistent experience across Zapier. Hundreds of companies have launched Zapier integrations and the Integration Development Guide is a list of best practices learned, so your users have the best experience with your Zapier integration. Your Zapier integration should not have more than 5 of each (trigger, action, or search) at first; we suggest starting with your most popular 2-3 use cases. Later on, we'll verify the Integration Development Guide is followed. Clone your integration and place it into invite-only mode. Doing so provides you a link to share this instance of your Zapier integration with prospective users. To see your number of users per Trigger, Action, and Search, check under the "Visibility" header in your dashboard. The intention of this step is to ensure any show-stopping bugs are worked out and verify existing user demand. Towards this end, your users should be non-QA emails and external or outside of your company. Zapier's support team serves as frontline support for your Zapier integration. If your users find bugs with your integration, we will surface them to your team. We expect your team to promptly reply to those requests from your users and to maintain your integration. Read our App Review Tips to help you better prepare your integration before submitting it for review. 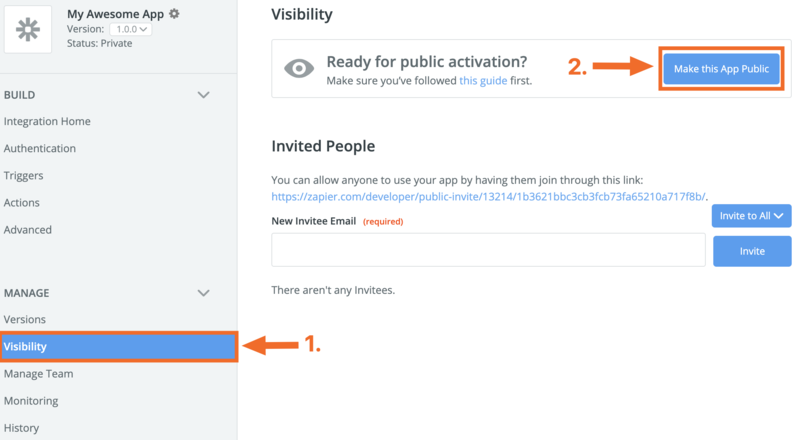 Navigate to the Visibility tab for your app and click the Make this App Public button. Expect to hear from us within a week. Now you get a page in Zapier's App Directory and your users can click it to gain early access to your integration. Note: You won't yet be able to create Zap Templates at this time, that capability is enabled once your integration reaches the public/beta step. As your integration continues to accumulate users and Zaps, our team will occasionally check on the growth/progress of your integration, and will contact you when we're ready to launch it into the public status. You can learn more here.